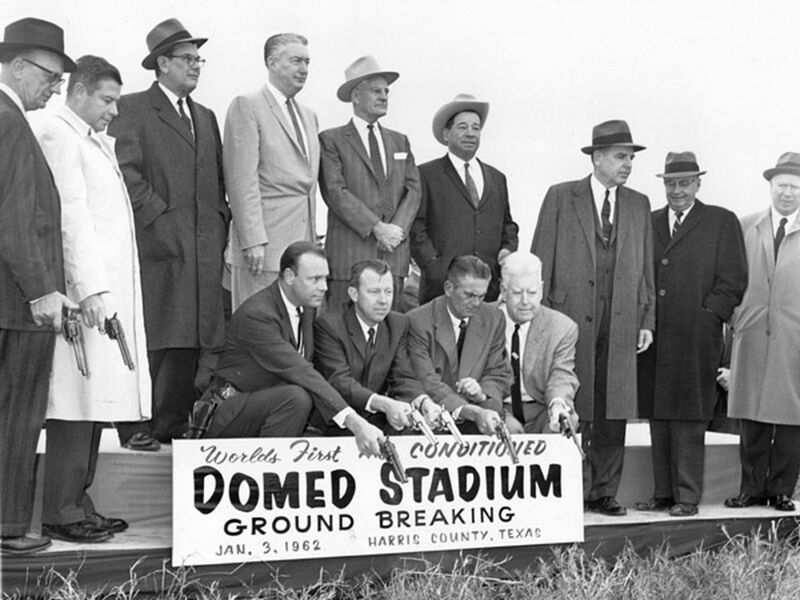 From the Annals of the Taxpayer Funded Stadiums – In 1962, the ceremonial groundbreaking ceremony was held for the Harris County Domed Stadium (later dubbed the Astrodome) in Houston. It was designed to be the first fully air-conditioned and completely enclosed sports stadium in the world. The Houston team at the time was named the Colt 45’s so the ceremony was not held with the standard gold-plated shovels. Harris County Judge Roy Hofheinz and other local dignitaries shot Colt .45 pistols into the dirt. Red is disappointed to learn they shot blanks and that the pistols have been lost to history; but it was a foreboding sign for a team that would take 55 seasons to finally win the World Series. The Astrodome itself is rusting hulk that has now sat empty for more than 15 years. This entry was posted in Today in Texas History, Uncategorized and tagged Astrodome, Astrodome Groundbreaking Ceremony, Baseball, Harris County Domed Stadium, Houston, Houston Astros, Houston Colt .45s, Houston Sports, MLB, Sports Stadiums, Texas History on January 3, 2019 by Red from Texas. Houston Astros regular season games are broadcast on AT&T SportsNet Southwest which also provides pre-game and post-game coverage and analysis. However, during the playoffs, ATTSNSW will be the only regional sports network that will not provide such coverage. ATTSNSW is declining to provide the local angle because “they don’t have the rights to broadcast the games.” They are clearly the outlier as the other regional networks will provide coverage before and after each game even thought they are not actually carrying the games either. In the American League, Yankees fans can get the local scoop on YES, Red Sox faithful on NESN, Indians supporters on SportsTime Ohio and A’s hangers-on on NBC Sports California. But for Astros fans, the final chance to hear Todd Kalas, Geoff Blum, Julia Morales, Kevin Eschenfelder and Mike Stanton chat up the Astros will be before and after the final game of the regular season on Sunday. Sad! This entry was posted in Texas Sports, Uncategorized and tagged Astros Network, Baseball, Houston Astros, MLB, MLB Playoffs, Texas Sports on September 28, 2018 by Red from Texas. From the Annals of MLB – In 1968, the Houston Astros and New York Mets finished the longest night game in Major League history. The game lasted 24 innings and clocked in at six hours six minutes. The game had started on April 15 but did not finish until 1:37 a.m. the next day. In the bottom of the 24th inning, the Astros loaded the bases. Bob Aspromonte hit a routine grounder to utility infielder Al Weis who was filling in at shortstop because Bud Harrelson had a sore arm. The ball went through his legs to score Norm Miller and end the game with a 1-0 Astros victory. The game was also notable because it was the longest scoreless contest in baseball history. This entry was posted in Today in Texas History, Uncategorized and tagged Al Weis, Bob Aspromonte, Houston Astros, Longest Game in MLB History, MLB, New York Mets on April 16, 2018 by Red from Texas. Sports Illustrated has name two Houston legends – Jose Altuve and J.J. Watt as its Co-Sportspersons of the Year for 2017. They were bestowed the award for entirely different reasons. Altuve had one of the most magical seasons imaginable winning the American League batting title, MVP and Silver Slugger awards. Oh, and yeah – winning the World Series for the first time in Astros history after the city was devastated by Hurricane Harvey. Altuve carried the team at times during the post-season recording a record 17 hits, 6 home runs and batting .472 at Minute Maid. Other than Mike Trout he is probably the best baseball player alive right now. And by all signs a credit to his community for charitable works and tremendous attitude. Watt on the other hand, had a miserable 2017 on the field. He played in 4 games with zero sacks and was lost for the season early in the Chiefs game . All of this coming after losing most of the 2016 season to injury as well. Whether he ever returns to the greatness he showed during his first 5 years in the league is questionable at this point. But in the face of Harvey, Watt determined to raise some money for relief. He set his goal at $200,000 and ended up raising $37 million and it appears that almost all of that money has gone or will go to actual relief efforts. So two Houston athletes get well-deserved kudos from SI. This entry was posted in Texas News, Uncategorized and tagged Houston, Houston Astros, Houston Texans, JJ Watt, Jose Altuve, Sports Illustrated, Sportsperson of the Year, Texas Sports on December 5, 2017 by Red from Texas. It’s not every day that your team is beaten by Gimli son of Gloin! This entry was posted in Texas Sports, Uncategorized and tagged 2017 World Series, Gimli, Houston Astros, Los Angeles Dodgers on October 25, 2017 by Red from Texas.